As we rolled over, first, the Bolte Bridge then took the West Gate Bridge out of town, Melbourne felt almost like a different city in the soft light of dawn with its bare, quiet streets. But give it an hour or two and the mighty West Gate would be bumper to bumper again, with commuters streaming rank and file into the city centre. By the time that happened, however, we would be at least a hundred kays away, on a near empty stretch of highway with another 3700km ahead of us. 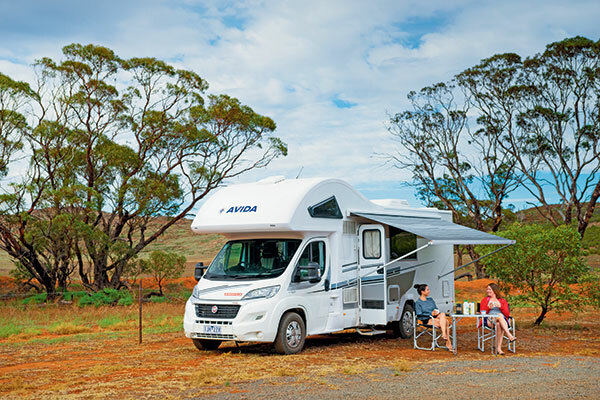 The Great Australian Road Trip is a rite of passage that most Aussies undertake at least once, at some point in their life. For many lucky readers, it might even be a way of life! I’ve taken more than my fair share of road trips over the years, I reckon, but, despite a burning desire to do so, I’d never made the time to drive across the country between my hometown of Fremantle, WA, and my adopted home of Melbourne, Vic, across the Nullarbor Plain; surely one of the most iconic Aussie road trips of all time. 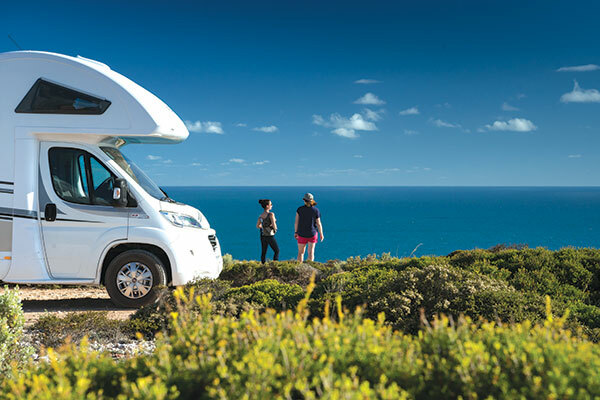 So when the opportunity arose to head across the country with Ali Millar, the editor of the Campervan and Motorhome Club of Australia’s (CMCA) magazine, The Wanderer, I jumped at the chance. Along with our photographer Matt and videographer Steve, we planned a route that was, perhaps, not the most direct but certainly one of the most interesting and scenic ways of getting from A to B – or from Melbourne to Perth. We planned to cover the roughly 3500km distance in seven days. I used to lived in the Republic of Ireland, where you can literally cross the country east to west in four hours, and I spent a lot of time while there trying to illustrate or articulate just how big Australia is to Europeans. “It’d take about three days to drive from Perth to Melbourne. It’s about 3500km,” I’d say, resulting in puzzled looks and head-scratching. “But that’s like driving from here to Russia; you’d cross at least five countries before you get there!” they’d exclaim! In our case, it was just three states – and only about half of Victoria, if you want to get technical! 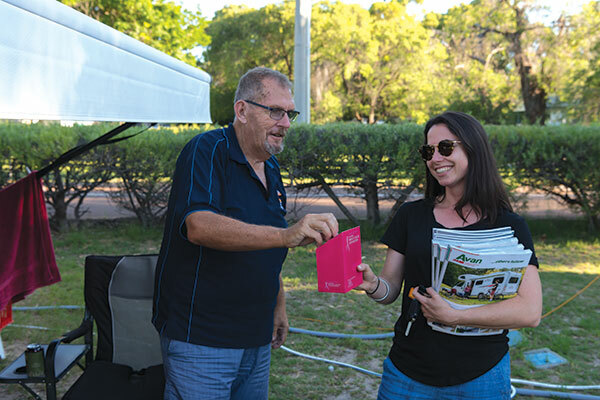 We planned to make the most of our trip by raising money for the National Breast Cancer Foundation along the way and set our target at a dollar per kilometre, to be raised before, during and after the adventure. Avida RV generously got on board by offering a brand new Avida Birdsville motorhome for the trip and, from there, we were almost ready to go. 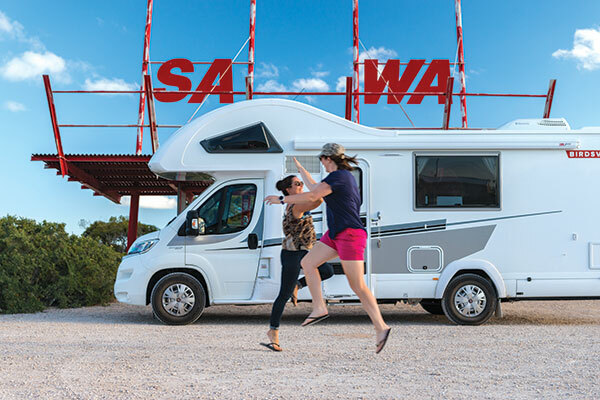 After picking up the Birdsville from Avida dealer Roberts RV in Campbellfield, Vic, one afternoon, I started to get to grips with the motorhome on the drive home. After tackling bumper-to-bumper peak hour traffic then steep, narrow country roads and single-land bridges, I felt like I could handle anything. “The Nullarbor will be a breeze after that,” I thought. Although the Birdsville comes with a whopping 782kg payload, we initially thought storage space might be an issue – not for Ali and I, who travelled with one bag each, but for Matt and Steve, who are physically unable to travel light! With seven bags of camera gear between them, we made good use of every nook and cranny we could find inside – and outside – the Birdsville, including the cavernous spaces under the lounges, and even the shower! 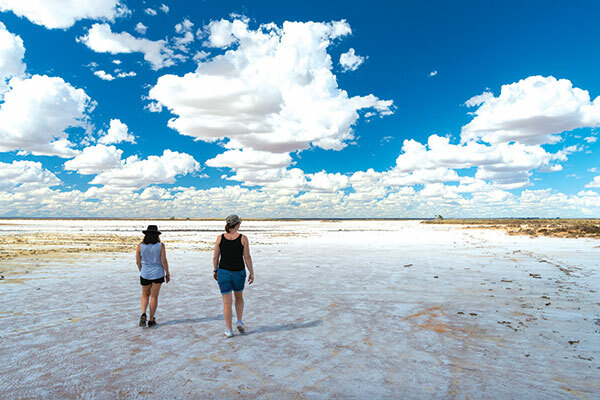 After farewelling Melbourne, we set our sights on Murray Sunset NP – a semi-arid park famous for its glistening pink salt lakes in far north-western Victoria, and our camp for the night. “Are you just going to put Fremantle into the GPS?” my co-pilot Steve enquired, as I fiddled about with our Hema HX1 navigation system. After a night’s free-camping next to the salt lake at Lake Crosbie campground in Murray Sunset – where we started as we meant to continue with happy hour drinks and cheese, followed by a delicious barbecue cooked over a roaring campfire – we hit the road again. 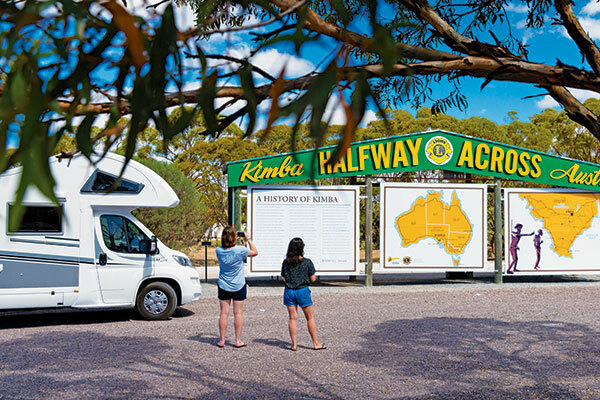 Our less-than-direct-but-very-scenic route across the country took us to Melrose, SA, in the southern Flinders Ranges, and on to picturesque Streaky Bay, SA, via Australia’s ‘official’ halfway point of Kimba, SA. That was a pretty momentous occasion for our party, but knowing we still had to cross the Nullarbor proper, then the entire state of WA, Fremantle still seemed like a very long way away. From Streaky Bay, we headed slightly north then directly west across the Treeless Plain. This day was the most interesting and meaningful to me, as I was actually doing something I’d long dreamed of. And while the scenery out here was nowhere near as dull as I’d been led to believe, so much else happened which really brought the Nullarbor to life. West of Port Augusta, we started seeing magnificent wedge-tailed eagles feasting by the roadside every few kilometres. The road trains thundering past scared them off every time we spotted them and it meant we weren’t able to get great footage, but just watching them from afar was impressive enough. 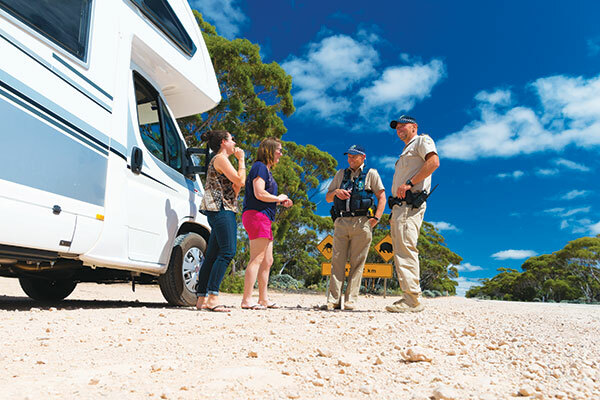 Just past the settlement of Yalata, we encountered a couple of friendly outback cops who were keen to hear all about our trip, have a look through the motorhome and talk drones with Steve. Anything to break up another long day on road – for us and for them! As the road drew nearer the coast, the change in scenery was obvious and intriguing but we were absolutely blown away by the spectacular cliffs and views out over the Great Australian Bight. We spent that night in Eucla, after crossing the SA/WA border at Border Village and, again, relinquishing most of our fresh produce to the friendly quarantine officer stationed there. Curiously, but happily, she let us keep our onions for that night’s barbecue by cutting the ends off them – and we did the same with the carrots! The following day, we made tracks for Fraser Range Station. 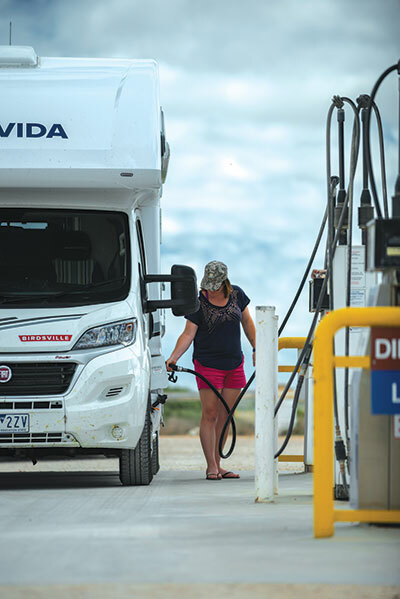 It was another long, 605km-day behind the wheel across the western part of the Nullarbor – including the infamous 93km stretch of dead straight road between Balladonia and Caiguna. But we looked forward to the home-cooked meal that awaited us at the ‘oasis’ (as it’s frequently called) of Fraser Range. 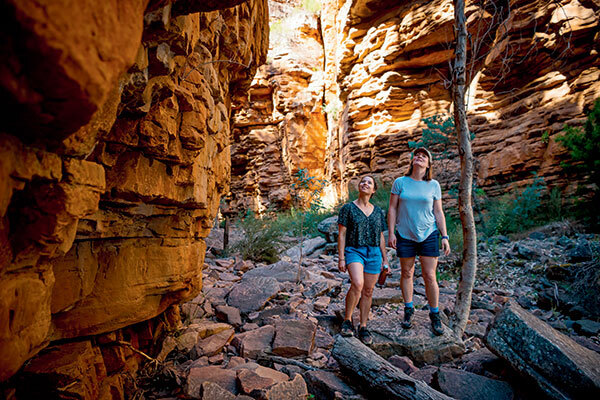 A half-a-million-acre former sheep farm-turned-cattle ranch with a strong tourism focus, Fraser Range station was the first station on the Nullarbor but is also one of the smallest. The next morning, we rose before dawn to hike up to the ‘summit’ of the range to catch sunrise. With warnings about King Browns also being frequent visitors to Fraser Range ringing in our ears, we were delighted to spot only wallabies and a few emus dotting the landscape. This was the shortest driving day of the trip – just 309km to the Goldfields town of Kalgoorlie, with plenty of time on arrival to explore the Superpit gold mine, the historic main street of Boulder, the infamous Kalgoorlie Two-Up Shed and the iconic pubs and hotels of Hannan Street. 3300km down, only 600km to go and we knocked that off the following day, arriving at the Discovery Park Woodman Point, about 10km from Fremantle, WA, in the early afternoon after skirting around Perth from the east. 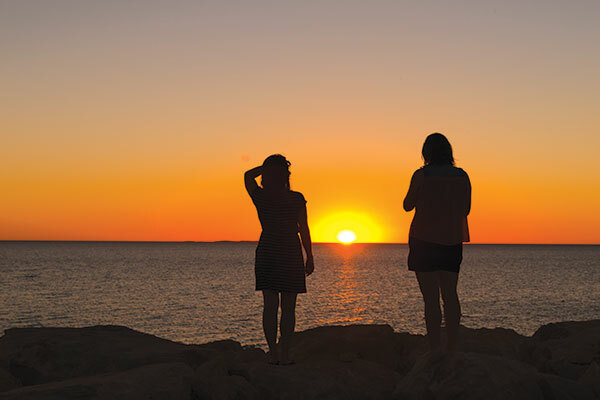 A short, 10-minute walk from the holiday park along a walking trail brought us to the beach, where we swam in the Indian Ocean (a first for a couple of our party) and sprawled on the warm sand to watch the sunset over the ocean – another truly iconic Australian pastime. After seven days, 3900km, about 600L of fuel, more than 5000 photos, countless hours of video footage, too many pies and parmas, not enough vegetables, and zero mechanical failures, we had done it. Our Avida Birdsville Cross-Country Epic had come to an end and we’d all had the experience of a lifetime.